Since United Methodist Church, St. Keverne, came into being in January 2017, we have moved joyfully into God,s vision and plan for us as his Methodist people in the village. Our new name and the cross of Christ is there for all to see. We meet for worship at 11.00 a.m. each Sunday in our hall. You will find spirit-filled worship, a warm welcome, refreshments and time to chat. Please refer to the Plan for details of services – we regularly worship in other churches in our area where you are equally welcome. Fortnightly on a Friday morning we meet for prayer at 9.15 a.m., praying for the needs of the world, our Circuit, church and village. Monthly, on a Wednesday, we share worship with staff and residents of Polventon Residential Home in the village. There is opportunity for Bible Study and discussion at an Ecumenical House Group, and across our Circuit. Through East Lizard Helpline volunteers from the chapel, other churches and the community, provide transport for people to medical appointments as far away as Plymouth. 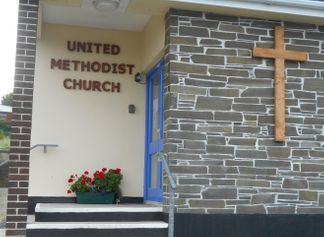 United Methodist Church St. Keverne and Parish Church together also provide a monthly social event or an outing for senior citizens living alone. We work together organising a weekly toddler group in term time. A monthly Community Lunch providing a three course meal with tea/coffee, all for £3.50, also draws on an ecumenical team, boosted by lots of help from the village. Reaching wider, The Men’s Breakfast is on one Saturday morning a month, held in a local restaurant, with speakers from a broad range of backgrounds showing how they are ‘Christians in the community’. Please join us or contact us. We should be delighted to hear from you. From September and the start of the new Methodist Year, two very exciting things are happening in St. Keverne and The Lizard Section. 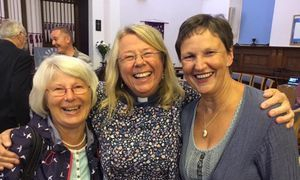 Firstly, from September, Janet Ings and Jackie Allen will be working as Circuit Pastors in The Lizard Section alongside our minister, Rev. Fran Lane. We just dont know yet how God will lead our work, and we are very open to His plan for us. Secondly, the team will be organising Drop In afternoons in our Church in St. Keverne on each Wednesday afternoon, except the first Wednesday of the month. The first Drop In will be on Wednesday, 13th September, 2.00 p.m. -3.30 p.m. If you are around St. Keverne on Wednesday afternoons, please call in and see us we shall be delighted to see you.